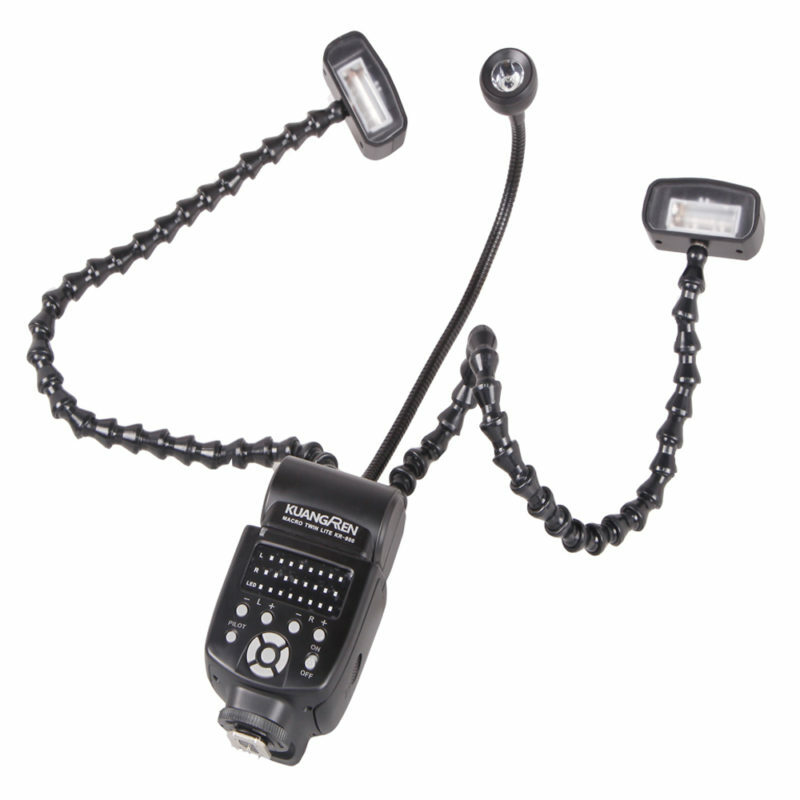 The KX-800 comprises three flexible arms, two flash heads and one LED, for lighting very small objects such as flowers and insects. Chinese manufacturer Venus Optics, known for their 2:1 macro lens, has announced they will release more dedicated macro equipment. This time they have introduced a rather interesting looking macro flash, or ‘Frankenflash’, that almost looks like the subjects it is meant to be illuminating. The Macro Twin Flash KX-800 features three flexible arms, onto which two flash heads and one LED focusing light are mounted. When both flashes are fired simultaneously their combined power ouput is 58 meters at ISO 100. Arms on which the flashes are mounted have a length of 48cm. The main purpose of these arms is that it gives the user more control and the flexibility to position his light exactly where he or she wants it, while still having the flexibility of moving around and following insects. Both flash heads have their own power control on the base of the flash and can be manual adjusted in 8 steps (1/1 – 1/128). The IGBT circuit makes sure that the flash duration stays within acceptable limits, which ranges between 1/200 and 1/20000s. Unfortunately no high-speed sync (HSS) is available. With a set of four AA batteries the KX-800 is able to fire at full power up to 100 times, or 1500 times at lower powers. Recycle times vary between 2 and 5 seconds. One thing is sure, the ‘Frankenflash’ would not win any awards for its design, but it could be very useful for the macro photographer on the move. No more fussing around with heavy and expensive macro flash brackets. What do you think? Is the Macro Twin Flash KX-800 a classic example of function over form? The flash can be bought for $279 through the website of Venus Optics.